School starts today, after the long summer break. Already on Fb I've seen a few photos - my nephew's first day at high school, my friend's second son's first day at school. I'm smiling at these photos - I like them. Because first day of school means I get my city back. 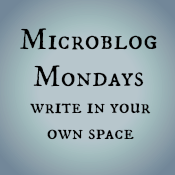 You can see what I mean on my #MicroblogMondays post on A Separate Life. True - though I can usually avoid it! Nice! Glad that you have your city back! Ha -- a great way of looking at it. The city is yours to have!! so true! I love traveling school is in session and prefer to stay in our town when it isn't. It is great to be able to have that flexibility and freedom.